Many blessings are yours on the occasion of your engagement to be married. May your wonderful journey be filled with love and happiness. I'm really happy for you both. 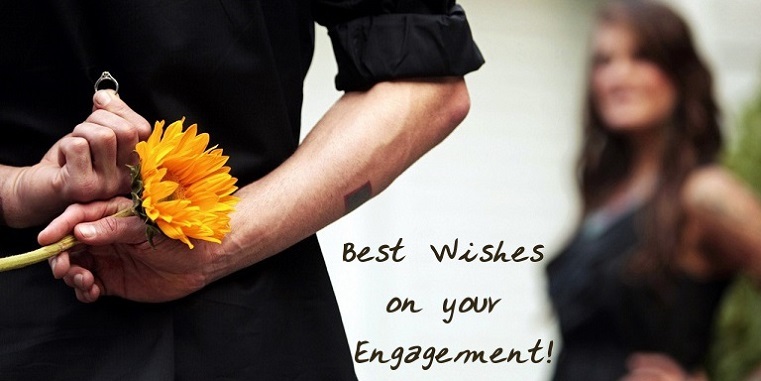 Wishing you all the best with the engagement and beyond! Lots of love. So happy to hear your great news! May your engagement signify the start of something really great. To a great couple. Congratulations on taking this exciting step together. May you make your relation a wonderful and a pleasant bond. Congratulations with this wonderful commitment to each other. I knew you two are made for each other. May you always stay in love for the rest of your lives. I'm so happy you have found love in each other. All the very best with the wedding plans and have a lovely life together. Best wishes on your engagement. Wishing you the very best as you begin to plan your lives together. May your sweet pair be always happy. Happy Engagement Day! Wishing you all the best for the future. Stay together always! Congratulations on your wedding engagement. May your joining together bring you more joy than you can imagine. Good luck! The news of your engagement is certainly a wonderful one. I am glad for you. You're two wonderful people who make a great couple. Keep loving each other. Congratulations to the perfect couple! Your love has reached new heights. May your future be a bright and happy one. Congratulations on finding each other. Your Engagement is wonderful news! Wishing you both an eternity of love and happiness together. Congratulations on settling down. All the best with the wedding plans and may your relationship last forever! As friends and family wish you well! Congratulations to the future bride and groom! May your love grow for each other every day! Congratulations to a beautiful couple. What a wonderful news! God bless you both on your engagement. Congratulations on your engagement! You make a wonderful couple. Wishing that this be just the start of a long and wonderful journey.